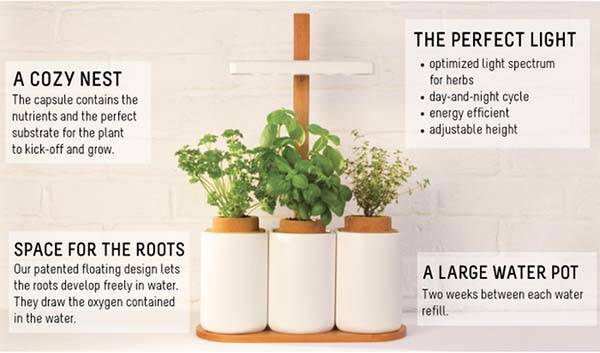 With three plant pots and included plant capsules, the Lilo plant system allows you to grow herbs, flowers and veggies at home with ease. Curious? Let’s go on checking. The Lilo is an elegant and easy-to-use app-enabled plant system that contains a wood tray with LED light system and three plant pots. 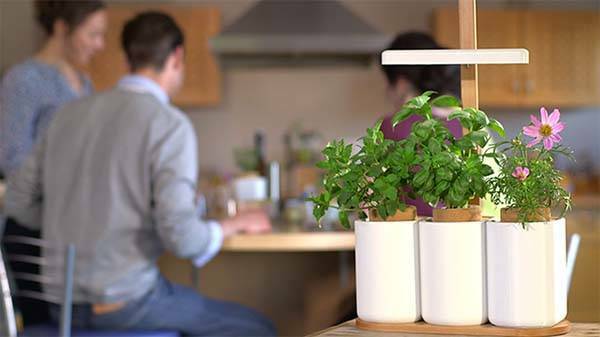 As shown in the images, the plant system sports a sleek and minimalistic design plus growing plants in order to bring joy and taste in your kitchen in a stylish way. The Lilo has numerous varieties of herbs including basil, mint, thyme, coriander and parsley, oregano, chives and etc. Each one is packed in a capsule containing the nutrients abs the perfect substrate for the plant. All you need to do is just insert your favorite capsules in the three pots and add water in, and its patented floating design allows the roots freely grow in water, whilst its LED light system with adjustable height provides optimized light spectrum for your herbs. In addition, the plant system also features a custom mobile app that offers planting tips, useful recipes and interesting facts. The Lilo has been available for preorder. Pledging €59 (approx $65 USD) will let you own the plant system. If you’re interested, head to Kickstarter for more details. Additionally, if you want other options, you may like to check the automatic house plant watering tray.